ust in case you are curious, this is me – I look better at a distance. The rod is a Hardy 15 foot 4 inch speycaster, the line is a Wulff 10/11 spey floater and the rock I’m standing on is in the River Garry, Invernessshire. Those waders leak in the crutch, which is why I’m standing on the rock. Invernessshire really does have three consecutive ‘s’ in it and that is what a single spey cast should look like when it’s done properly. I keep the photograph to remind myself. After they let me out of school, I qualified as a doctor of medicine at the Middlesex hospital, London, in 1982, did all sorts of surgical stuff including research into plastic surgery at the Queen Victoria Hospital East Grinstead, and then became a GP, much to everyone’s surprise. To the American members of the audience, a GP is a family practitioner. Right now I work four days a week as a doctor, moonlight as associate editor on Waterlog magazine, fish, tie flies, collect fishing books, research fly fishing history and fly a Rallye Galopin from a grass airfield close to my home. I am married to a consultant physician, who keeps me in the style to which I like to be accustomed, and we have one daughter, two labradors and a bay mare called Chloe. I forgot the goldfish. 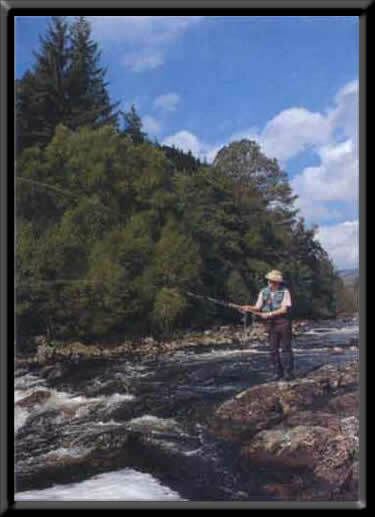 You can order my book on The Treatyse of Fishing with an Angle and my History of Fly Fishing by e-mailing the Medlar Press. You can email me at ffh @ btconnect.com (take out the spaces either side of the @, they are there to throw off the bots which trawl around the web looking for emails to send spam).